How Cloud Computing can help in Business Process Improvement? 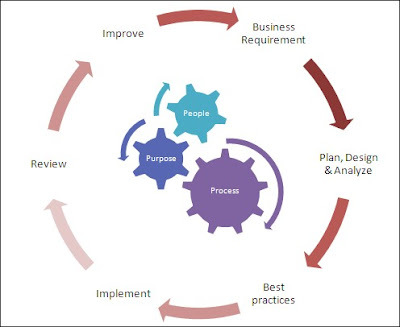 Business Process Improvement (BPI) is a systematic approach to help an organization optimize its underlying processes to achieve more efficient results. And you would be surprised to know that top priority of cloud computing technology is also the same; efficient utilization of available resources. Cloud Computing enables organizations to dramatically increase the speed of change and apply business process management (BPM) better and faster. The unique combination of BPM and Cloud technology complements existing enterprise software and adds agility to business operations. When we talk about intersection of cloud computing and constant process improvement, we find that both are meeting at the crossroads and are helping organizations to achieve their goals in a more cost effective manner using best of both the worlds. The cloud frees the organization to focus on mission-critical tasks instead of purchasing, configuring, and maintaining redundant infrastructure. A BPI project is the same as any other project - you create a project plan to help keep you on track to guarantee a successful implementation of a new or improved business process. Companies have to spend an ample of budget for the purchase of business management solutions and the integration with the existing IT infrastructure or create their own BPI project to maintain the same. With the advent of Software as a Service (SaaS) on-demand web-based/client model applications, business organizations have become autonomous in executing various tasks smoothly with less man power or heavy IT investments. SaaS applications save time, effort, cost and also offer benefits to business due to their multi-tenant efficiency, flexibility and scalability features. • Start with a small process that can be completed using cloud computing. • Focus on process enhancement before implementing new ones. • Management and primary stakeholders must be involved while deciding on cloud computing technology. • Align the implementation to the business goals. • Use Benchmarking to get measurable results. • BPI should focus on “doing things right” then “doing the right thing”. BPI enables organizations to be more efficient, more effective and more capable of change than a functionally focused, traditional hierarchical management approach. Cloud computing makes it easy to implement BPI within an organization by providing a quick proof of concept for each step of BPI plan and implementing the top priorities of business processes faster, better and cheaper. I have been hearing so much about cloud computing and cloud computing companies. Anything that saves you money is a great thing. I had no idea cloud computing wasn't brand new, I thought it was.